I'll admit right up front that I was skeptical about this book. My friend Gail had been bullying me for awhile to pick up the series and give it a try, but honestly, the whole Harlequin thing kind of turned me off of the entire idea (even if it is being published through Harlequin Teen). It kept getting great reviews, as did the subsequent books, but it really wasn't until the third book was released and it was dedicated partly to Gail that I figured I should give it a try. 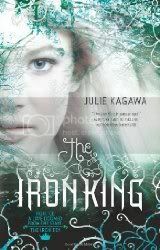 If one of my best book friends was willing to promote the series so much that the author dedicated the book to her... well, I figured it was time to read at least the first one, The Iron King. I loved it! Julie Kagawa has such a natural story-telling ability that I was completely sucked into the story, immediately. Her characters are believable and her landscapes are tangible. I was thoroughly enjoying the book when she added in such a compelling and new idea, I was practically jumping up and down from the excitement I had. Her ideas about the new breed of Fey is genius. It seems so obvious, I'm surprised nobody has come up with it before (and maybe they have, and I just don't know about it), but she took the idea and ran with it. I don't really want to give too much away because it really is in the realization of what the new Fey are that makes it so interesting, but needless to say, these are Fey for the 21st century. The story centers around Meghan Chase, your typical teenager trying to make her way through high school and life. She has all the typical high school problems: family, boys, school. But it isn't until a dark stranger starts following her and her best friend, Robbie Goodfell, starts to act overly protective of her that things start to get really strange. It all culminates in Meghan discovering that she is the child of a faery king and that she is being used as a pawn of war. Add in the mysterious Prince Ash, and you have all the elements you need to for one great story. Oh, and don't worry, for those curious there isn't too much romance, if any. For a Harlequin book, they really were light on the romance and heavy on the action for this book. If you're looking for an original story set in a at turns familiar and yet strange land, I'd highly recommend The Iron King. I'm sorry it took me so long to getting around to it, and I'll admit that maybe, this once, Gail was right. But don't tell her I said that. She'll never let me live it down. I agree, this book was more than I expected and I'll be recommending it to any fantasy fan. Great review! Just this once?!? My friend...when have I ever let you down with a book recommendation? Glad you liked it though...now go forth and read the rest!